Whoop whoop! I had my annual “Know Your Numbers” screening last weekend for work, and since my last screening I’m down 12 lbs, my waist is 3.5″ smaller and my fasting blood glucose level dropped by 12 points! The vast majority of this progress has happened since I started at Extra MYLE in November – thank you for the motivation – I love the gradual and SUSTAINABLE learning and progress. Welcome to the best place for serious lifestyle changes! I’m so very happy here. Today marks months I’ve been at Extra MYLE, I’m one pound from my goal weight but I still have to conquer pull-ups! And I just bought a new bikini and I am so owning it!! Bring it on! Thank you! Thank you, I know that I am just getting started on this path but, with that said I stepped on the scale this morning and its the first time in two years that it moved down. woohoo! – Feeling motivated. Down 2 pant sizes, yes it works folks, hells yeah!! Met three major goals! 1) finally did the beast crawl all the way on my last set this morning. 2) have to reorder my maid of honor dress for my sisters wedding because the one I have now is too big. 3) broke 190 lbs which I haven’t been able to do in three years! and thank you lab family for all the support! OWN IT!!!! Hey guys. Just wanted to share some crazy things!! When I started this program on Team Awesome I was looking for a way to kind of jump start my life and kick it into gear. 7 weeks later I’m over 20 lighter, have a completely new look (those of you who were in the 5 am group saw the major hair upset), and now on Monday I am starting a new career with a new company that could not be more exciting. Keeping focused on the prize… Accomplishing the small goals all made it possible for this complete life transformation. Keep it up Bod Squad!! It was like eight months ago (give or take) that I had a mental breakdown in my closet at 3a.m. trying on all the clothes that used to fit me, and still didn’t several months after I had my baby. Nobody tells you how self conscious you will be after pregnancy, and pregnancy sure didn’t do me any favors! It makes me sad that I don’t have a lot of pictures with my newborn because I hated how I looked, BUT…. I’ve been working hard to get back down to where I want to be (I’ve a…lready lost 20+lbs on my own) and with Fitness Revolution’s help these last few weeks, I can now fit into my pre-pregnancy jeans! I cannot tell you how ecstatic that makes me! Yes, they are tight and yes I was much leaner and toned when I wore them before, but that is one HUGE step in the right direction for me because it is so much easier said than done to love your body after pregnancy! I’m so thankful that my friend sent me the link to participate in this challenge! I am so unbelievably happy this morning!!!! I have been traveling this week and begrudgingly got up at 4:30 am to get my workout in. At the end, I noticed a scale in the corner of the hotel gym so hopped on. Then I got back off and weighed again. I am officially at a weight that I have not seen in 10 years!!!!!!!!!! Brett Denton and Sally McCarthy….I am SO grateful for your guidance. I really though I was never going to get this weight off and had tried EVERYTHING I could think of on my own. I have worked hard, but there is NO doubt in my mind that your program is what has allowed me to make this change. I have only 7 lbs more to go before next Sunday. Happy to report that my final weigh in totaled a 25 lb. loss! I’ve truly enjoyed this challenge and plan to keep it up with my new found family and the staff at FR! Thank you everyone! I weighed in two days early (I started two days late) and am BEYOND thrilled, excited, ecstatic, deliriously, terrifically, over-the-moon HAPPY about my final result. This has probably been the hardest thing I have ever done. And I’m so pleased, and pleasantly surprised with my results! A huge shout out to Justin Wallace for remembering my name from the very first day, and pushing me to go a little longer, a little harder each time, for his support and encouragement. I think I’ll miss you the most. To Sally McCarthy, for being so patient, kind, and understanding with my need to start late, miss the orientation, ask a thousand questions, and for the support and encouragement, and genuine happiness for me today when I made the goal. To Brett Denton, for offering the challenge, answering repeated questions, addressing concerns and guiding me through the whole process. I honestly didn’t think I could do it. I learned that I have more ‘grit’ than I gave myself credit for. And I have not stopped smiling all day. Will likely Smile in my sleep tonight. Congrats to everyone who completed the challenge. You guys rock!! One more workout to go in the 6-week challenge. I just want to give Justin Wallace a huge thank you for pushing me to do more, encouraging me, and making these the best workouts I’ve ever done. If you haven’t attended Justin’s class you should give it a try. Equally important to me is the opportunity I had to get to know Suzanne Hickok, Aimee Allison Hughes, Cristina Correia Brischler and Marci Smith. You are an inspiring group of women who always encourage me to push on. Not to mention being cheerful every day which is tough at 5am for a group of “not” morning people. Thank you! And a final shout-out to Sally McCarthy who checked in regularly, guided me, provided assistance and noticed my progress in a mere photo. Hard to do on a big girl. I am about 2 lbs away from the goal, but regardless of how I finish on the scale I finish with new friends, a stronger, fitter, thinner body and a great start to 2014. I own it all! Success! Since starting this program, I have lost a total of about 10 pounds, and gone from 29.5% body fat to about 25%. I’m within 3% of my goal, and I never thought this was possible in my lifetime, nor did I ever think good ‘ol diet and exercise would be the way to do it. My weight finally matches my driver’s license : )Like Teresa, I’m right on the cusp of achieving what I set out to do, and I now have the tools to do it. I’ve mostly been compliant during the ‘freedom’ stage, and maintained my weight lost, but I realize that I still make mindless choices without thinking. I truly believe that I can achieve my goal of 22% body fat if I just stick to the plan, and continue along this path. Since I started this program I have lost 4.8% body fat and 12 pounds. I am so amazed at my results in such a short period of time! This is the first time in my life that I have known exactly what my body fat% was or really measured myself. I used to think that as long as I fit into my clothes then I must be healthy. This program has changed not only my life but has also opened my eyes to the terrible foods out there that I was feeding my daughter. Now I can ensure that she is able to grow up eating healthy and living healthy! I am also excited about my results. I’ve lost 11 pounds and body fat is down 6.4% to 18.2% – yeah!! My goal was 19, so that’s good. Now, I’m just looking to maintain and continue to get stronger. I still have a goal of completing 10 real, perfect push-ups and have a way to go there. I’m really starting to see this as a lifestyle change and not just a short term “diet”. Thanks Brett! I’m in the best physical shape I’ve been in life, which is amazing as I reach these middle ages. I’m very proud of this group – such great successes! Woot woot! Since we started this program I have lost 12 pounds, 8 inches overall and my body fat is down to 24.5%! I can’t remember a time in my life when it hasn’t been at 29% or higher–even with personal training! Next stop–4 pounds and another 2% body fat. I want to be in that lean, mean category and I am right at the cusp! Thanks, Brett Denton! And like Christel, I really don’t feel deprived, I just feel healthy! What an awesome day! (Even though I almost barfed after the fitness test this morning :/). The RESULTS ARE IN! Brett, I have to thank you for guiding me through the process of changing my life! I’ve never been so happy or healthy. When I signed up for this challenge, I did it for just that… the challenge. I had no clue how it would change my life for good. Through the process, I’ve learned so much, and my children will grow up just knowing what I’ve learned. They won’t have to learn it later in life. It may sound silly, but finding out my results today was one of the coolest moments I’ve ever had. I have accomplished so much in the last 3 months. The results just proved that I have every reason to be more proud of myself than I ever have been before! I feel so healthy. I feel so strong. I feel so happy. In the 3 months that we’ve been doing this challenge, I WENT FROM 28% BODY FAT TO 19%!!! I lost 10 pounds, and have not once been called “skinny”. I’m told that I look lean and strong. That’s the way I’ve always wanted to look… and feel. I couldn’t have done it without you, Brett. Thank you SO much! You are one smart dude. I am delighted with my results! My goal was to get to 23% body fat in a year but it’s only been 2 months and I’m already at 24.1%!!! And the real kicker is that it has been really easy! I don’t feel deprived, I love the food, I’m having fun with food creation and I’ve never felt so good, inside and out, in all my life. Thanks Brett for creating this wonderful program! Today I had my monthly appt. with my endocrinologist–three years ago I was diagnosed with PCOS and Hashimotos, which attributed a lot to the difficulty I had losing weight. I didn’t want to be put on a ton of medications because I’m pretty much anti-pharmaceuticals, but my doc said I had to start managing my diet and my weight or I was at risk for developing diabetes because of my screwed up hormones. At my appt., he came in looking at his chart and was very excited that I had dropped 15 pounds since my last appt. He said to keep doing whatever I was doing because obviously this was something that was going to work for me. VERY EXCITING NEWS!! Still not bad for an old lady. I am pretty proud of the accomplishments during this challenge and would recommend Brett Denton and Fitness Revolution Boise to anyone wanting to get healthy and in shape! Final weigh in! Grand total: 19 pounds in six weeks! 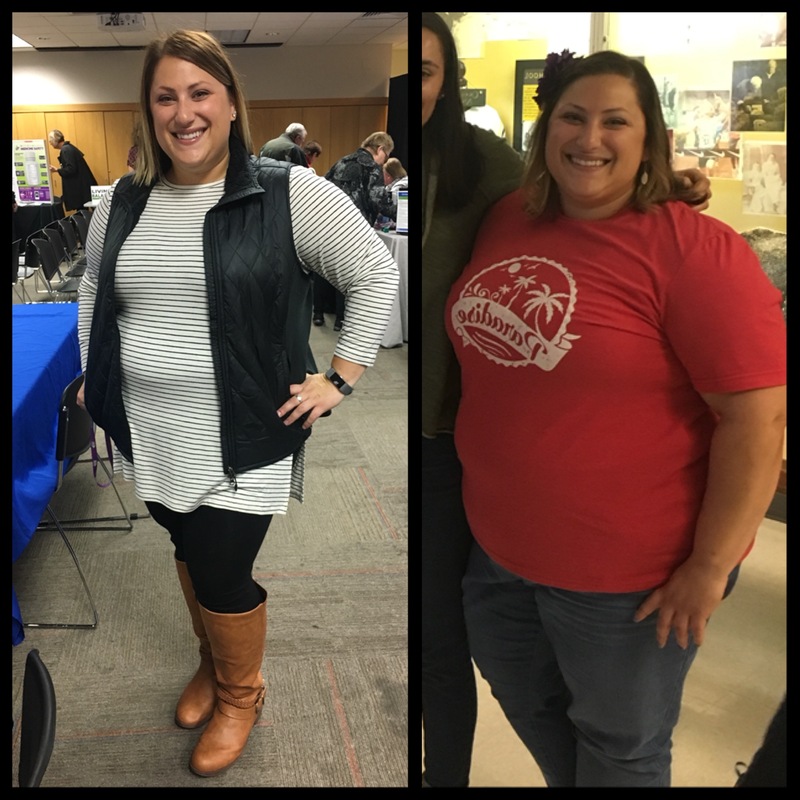 Down four sizes! Definitely sticking with this place!! I feel awesome!! Thanks Brett Denton! I want to say thank you to Fitness Revolution, and the staff! You all are amazing, such a great programs and support system. I lost 19 lbs during my fitness challenge and continued losing through your nutrition program. I have tried diets, personal trainers but Never had the success I have had with you! I’m down 30 lbs and feel Great!!! Thank you again for all that you do and caring! This is my first week doing the program and I just wanted to let you know I absolutely LOVE the meals! I love how simple, yet full of flavor the dinner meals are and I love how it totally takes the guess work out of what to buy and what to cook! I think you’ve done an excellent job adding variety into the weekly menu as well. I made the coconut crusted chicken tonight, and I did have a little bit of a problem getting the coconut to stick to the chicken, but the flavor was fabulous! Thanks for doing such a great job and making this so much easier! Eating healthy really does taste AMAZING!!! Thank you for offering this class. It was exactly the change I needed in my life. I absolutely love Extra MYLE and the staff. Brett is fantastic and always replies to my constant emails about if I can eat something or to commend him on the great meal plan he’s put together. I am already dreading my 6 weeks being over and trying to think of any way I can to stay on. It’s amazing how I’ve inspired others and have them following my progress on Facebook. This is already changing my life so thank you! I am so INCREDIBLY HAPPY (and thankful) that you set up this opportunity with Extra MYLE! I am so sore, but am finally starting to feel better about myself both physically and emotionally. I didn’t realize just how low I had gotten and being back at the gym, focused on health and fitness, I feel like I’ve gotten back on the right track. So, thank you a million times over! While we’ve had minimal contact and you don’t know much about my personal journey, I just want to take this moment to thank you and show you what 12 weeks of dedication and work looks like for me. As crazy as this sounds, but getting up at 530 am every morning to be at Extra MYLE is something I look forward to! My goals and vision board keep me focused every day! I don’t even recognize who I was in this photo. I know what got me there, but didn’t realize how much I had let myself go! I was at the tipping point, and this gym has changed my life. I appreciate your effort to make this possible for many people–from the workout variety, the meal plans, the grocery list, and the amazing staff. I still haven’t gotten the courage to take a full body photo because I know I have a lot left to go, but I’ll get there! I know I will! I’m so thankful and grateful for you–for guiding people in creating healthy habits in many areas of their lives! Your program has taught me so much and has helped in more was then one. In the past 5 weeks I have felt better health wise then i have all year with other programs that I have tried alone. I have also seen more results in the past 5 weeks then I have in the past months. For now, I just wanted to say “Thank you” for Extra MYLE and what you do! And Justin, he rocks. First off I’d like to say I don’t feel you have let me down at all. My time at Extra MYLE has been extremely rewarding. I haven’t weighed myself in a while, but last time I had lost 15 pounds and 3% body fat.Your fitness instructors are helpful, motivating, and positive and the menu plans have put me on track to a healthier lifestyle. That being said, I still have a lot of work to do. My goal is to fit into a size 10 again (currently a 14, but down from 16-18). My biggest road blocks are financial, low thyroid, and time. I am a single parent, and money is often tight, as is free time. I try not to focus too much on my weight as I think that inches count more. Most importantly though is the fact that I feel so much better! I am looking forward to achieving next years goals! I joined Extra MYLE in October and attended class twice a week as recommended and stuck to the eating plans to a “T”. I lost 18 pounds the first month and absolutely LOVED everything about the program, the classes and the eating plan.